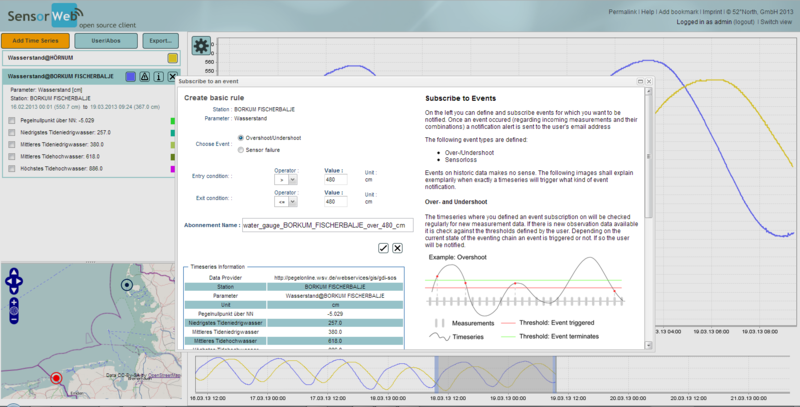 The SensorWebClient provides easy access to timeseries data stored within SensorObservationServices (SOS). A station measuring the phenomenon of interest can easily be picked from a map, discovered by station's metadata. After a station has been chosen, the data can be loaded and displayed in the client as diagram for further investigation. The client has been re-structured in the beginning of 2012 to evolve from an expert-driven design to a more end-user centric interface. Main target of this intend was to hide the complexity of data modeling of O&M, SOS. Take a look at the product page for more examples. The client is capable of connecting SOS 1.0.0 and SOS 2.0.0 instances. The client can be configured with arbitrary SensorObservationServices if these satisfy known SOS dialects or profiles (SensorWebClientSosHandler). The client can be extended with further SOS dialects to support even more. 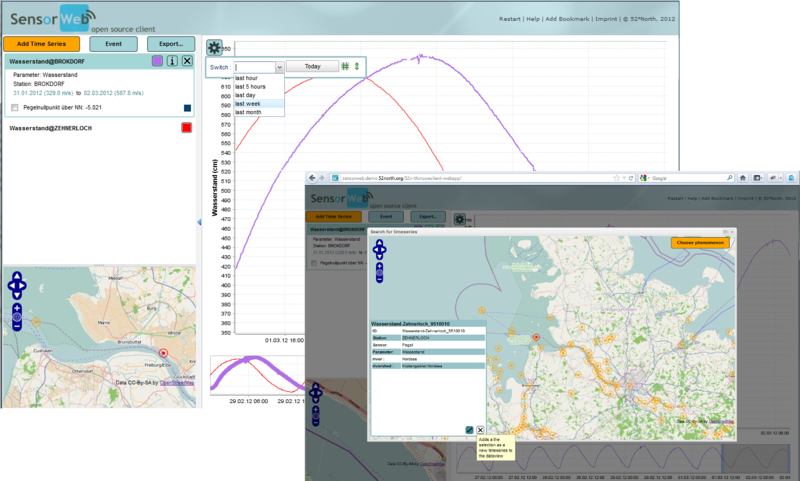 The Sensor Web Client's SOS module allows to reviewing phenomenons measured at one or more specific location(s). The data is queried from one or more SensorObservationServices so that different kinds of observation data can be compared: While one SOS may only provide temperature data measured by a weather station, another can be used to add water gauges of sensor stations nearby. The UI covers technical details and the complexity of Sensor Web standards. It aims at making access and review of observed continues timeseries data as easy as possible. Monitoring near real-time observation data is a typical use case for domain experts but also end users who are interested in a sensor measuring a continous phenomenon, e.g. water gauge or temperature. Pull-based messaging is a convenient approach to get notified when certain events happen. Such a pull-based event notification workflow can be achieved by an SOA architecture incorporating a SensorEventService and a WebNotificationService. An SES server can be used for filtering a data stream by means of predefined rules, whilst the WNS sends out messages to a particular communication endpoint (like SMS, or E-Mail). 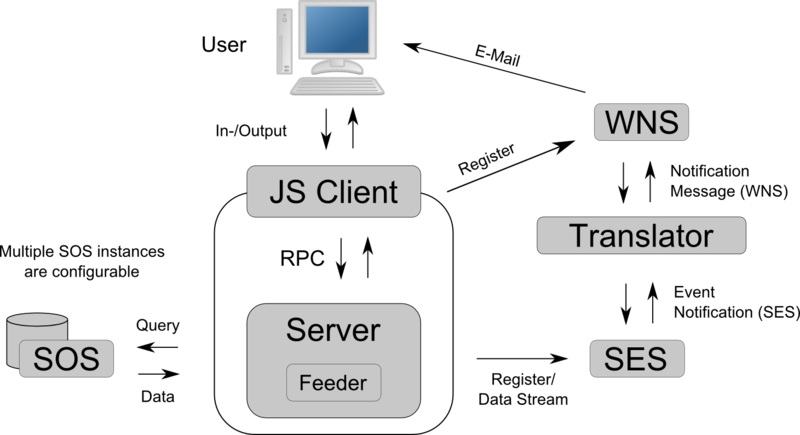 The Sensor Web Client's event subscription module gives a user control over this architecture. It combines selection, review and subscription on specific timeseries queried via the SOS interface (serveral SOS instances can be configured). 52°North Demonstration Client. Reflects the most current stable state. We have a mailinglist sensorweb@52north.org (https://list.52north.org/mailman/listinfo/sensorweb) where users and developer can ask questions to 52°North products and discuss related topics. Have a look at the 52°North posting guide to increase the chance to get help.